Preheat the oven to 350 degrees. Grease and flour miniature cake pans. **This recipe fills 10-12 miniature cake pans – I used a miniature Bundt pan – or about 6 cups worth. In a stand-up mixer fitted with the paddle attachment, mix together the sugar and olive oil on medium-high speed until well-blended, about 2 minutes. Add the zest, juice, eggs and vanilla and continue to mix until creamy, another minute or two. Turn the mixer down to low speed and add the flour, baking soda, salt, buttermilk and yogurt. Return to medium-high speed and mix until well-combined, about a minute. Divide the batter evenly into the mini cake forms, being careful to only fill the molds halfway full. Bake for 18-20 minutes, until a cake tester inserted into the center of each cake comes out clean. Remove from the oven and carefully invert the cakes from the pan. Let cool on a wire baking rack for 5-10 minutes. 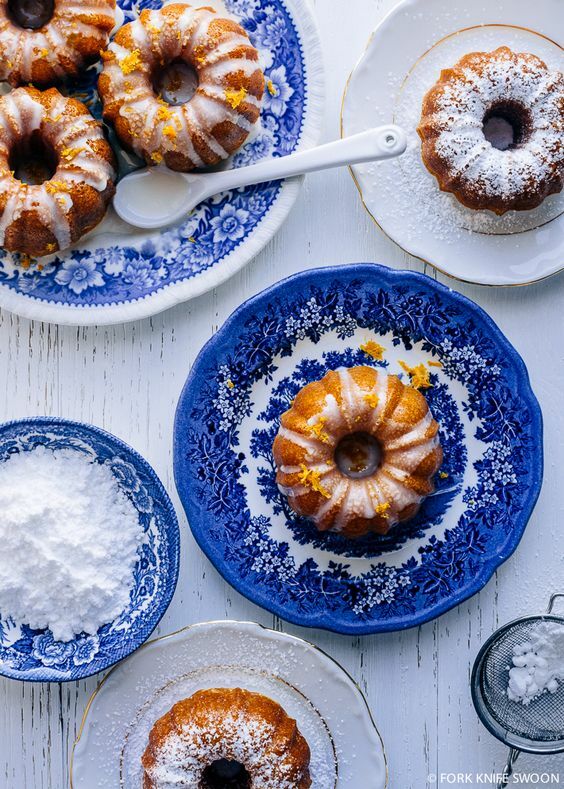 While the cakes are cooling, whisk together the powdered sugar and milk until smooth and fully-combined. Stir in the vanilla extract and lemon zest. Spoon over the warm cakes. Find the prettiest plates you have to present them on and serve.